Industrial style kitchens not only offers an effective work environment, but it is also practical and affordable. And this trend doesn’t seem to be dying down anytime soon, as homes of all sizes are incorporating this design into their kitchens. Best of all, you don’t have to waste money on making it look polished as this style celebrates ruggedness and rusticity. This look is very popular and simple to achieve, not to mention it also lends a very raw textural beauty to the kitchen, allowing you to get that industrial kitchen look you’ve always dreamed of. You don’t have to make every wall exposed, sometimes just one is enough. Lay some nicely stained wood flooring in your kitchen to transform it into a vintage looking industrial kitchen. You can also use wood for the cabinets and kitchen island to make it look more warm and homey. Consider creating a more modern looking industrial kitchen with the use of granite and steel in all the right places. Dark granite counter-tops coupled with some bright steel appliances pull this look together perfectly. It is all unified together by the light coloured tiled floor. Don’t be afraid of using any bright colours you fancy for your industrial kitchen. In fact, adding an bright splash of colour to the fixtures in the kitchen can make it look really outstanding and classy. You can find these colourful industrial products on the Nella website. Industrial kitchens are often thought to be all steely grit and rugged looking. 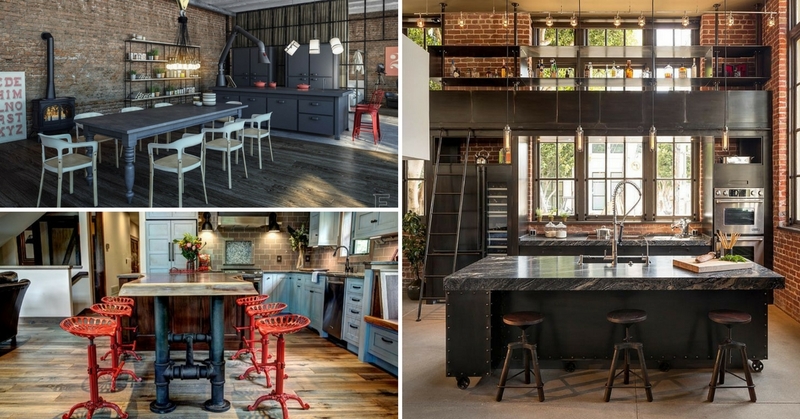 But if you are afraid of going all the way, start small by marrying both contemporary and industrial styles in your kitchen for a totally unique look. Altering some small pieces such as the stools or kitchen counter can give it the vibe you are looking for. Adding a chalkboard wall not only transforms the boring walls of your kitchen into a fun industrial kitchen, but it is also highly practical. You can now write down your to-do list, shopping list, important messages or just inspirational quotes on the wall. Industrial kitchens are all about showcasing the raw beauty of the space, and one of the best ways to do so is to proudly display your pots and pans. Construct a sturdy hanging rack above your kitchen work space for easy access and you get more shelf space at the same time. DIY some furniture for your kitchen by using some rugged steel pipes for table legs, which instantly gives street cred to your kitchen. Balance it out with some cute stools to keep things interesting. Instead of the usual exposed brick walls, you can go another way and use rough-hewn stones which looks both chic and stylish at the same time. It is definitely something different for the industrial kitchen vibe you are going for. If you are not a fan of that weathered, vintage look that industrial kitchens usually have, you can try and give a modern twist to the traditional industrial style. Keep things simple with a black and white theme to your kitchen. Often, you will find bare concrete walls, ceilings and even floors in industrial kitchens, as it is very practical and functional. But since your home is not a manufacturing facility, minimise the starkness of the kitchen by adding interesting elements such as colourful furniture or interesting lights to make it more homey. Stainless steel may be reminiscent of cold, sterile surfaces but if you actually use it for your entire kitchen it works amazingly. The wide usage of stainless steel makes it look more upscale and you can soften the coldness of it by adding warm wood tones. It is common knowledge that dark colours make things look smaller but in this kitchen’s case, making most of the fixtures and fittings a dark colour actually works really well. Lighten up the space by building some large windows to let in the natural light.